Once again, I have been honored by being asked to serve as the Honorary Chair of the annual Flavors Culinary Gala of the Los Angeles Division of the American Liver Foundation. The sixth edition of the fundraiser will be held on May 20th at the Loews Santa Monica Beach Hotel, starting at 5:30 p.m. with a cocktail reception and a silent auction, followed by a sit-down dinner. The worthwhile gathering will also be the tenth GAYOT.com Dinner Series. This culinary event is unique, as the chefs are actually cooking right in front of you at a table of only ten guests. It’s like enjoying your own private chef for the evening. You can ask them all the questions that you want, learn a few tricks and get some recipes, all while supporting a true cause. 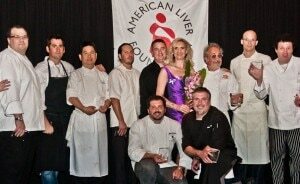 The fifth annual Flavors Culinary Gala of the Los Angeles Division of the American Liver Foundation will be part of the GAYOT.com Dinner Series as it was last year. The fundraiser will be held on May 22nd at the Loews Santa Monica Beach Hotel, starting at 5:30 p.m. with a cocktail reception and a silent auction, followed by a sit-down dinner. 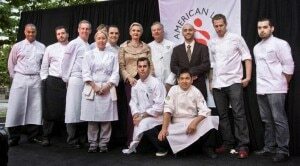 The participating chefs are: Jeremy Berlin, Church & State; Collin Crannell, The Lobster; Calvin Holladay, Flemings LA Live; Kevin Meehan, Café Pinot; Jean-François Meteigner, La Cachette Bistro; Larry Nicola, Nic’s Beverly Hills; Mirko Paderno, Oliverio; Keith Roberts, Ocean & Vine; John Sedlar, Rivera and Playa; Paul Shoemaker, Savory; and Shigefumi Tachibe, Chaya. I attend fundraising dinners quite often, but the one being held on May 23rd, outdoors at City National Plaza in downtown Los Angeles, is my favorite. Not because I am the Honorary Chair, nor that it will be the fifth GAYOT Dinner Series, but because of its unusual format.